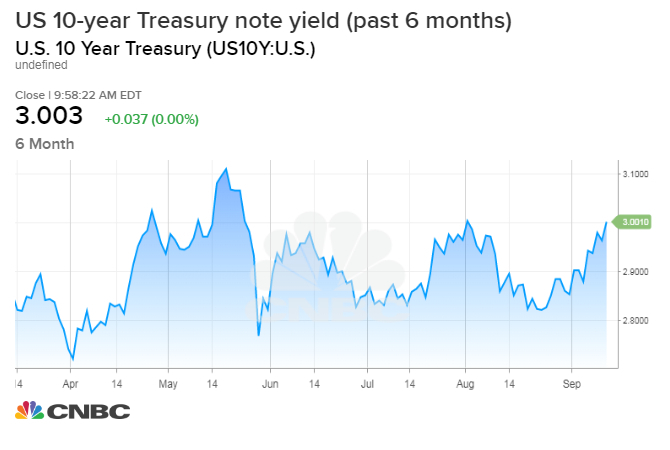 The yield on the benchmark 10-year Treasury note topped 3 percent on Friday for the first time since Aug. 2. Traders pointed to a revision in the retail sales figures out on Friday as the reason for the latest push higher in rates. Yields have been steadily rising since the start of September as expectations for economic growth creep higher. Traders pointed to a revision in the retail sales figures out on Friday as the reason for the latest push higher in rates. The Commerce Department said on Friday retail sales edged up 0.1 percent last month, the smallest rise since February. But July's figures were revised higher to show sales rising 0.7 percent instead of the previously reported 0.5 percent gain. "Look at retail sales, I think people are focusing on that and third-quarter GDP estimates, which are very close to 4 percent," said Thierry Wizman, global interest rates and currencies strategist at Macquarie Group. "The revision was very positive for July." Consumer spending accounts for more than two-thirds of U.S. economic output and is often considered a forward-looking measure for gross domestic product. As of the latest reading, the yield on the benchmark 10-year Treasury note was higher at 2.996 percent at 3:59 p.m. ET, down from highs above 3 percent hit earlier in the session. The yield on the 30-year Treasury bond was up at 3.13 percent. Bond yields move inversely to prices. Yields surrendered some of their Friday gains after reports that President Donald Trump wants tariffs on $200 billion of Chinese goods despite the U.S. attempt to restart talks on trade. The president told aides to go ahead with tariffs, the reports said, citing four people familiar with the matter. A preliminary look at a University of Michigan report on September consumer sentiment showed that Americans remain optimistic on employment and wages. The university said sentiment hit 100.8 in September, up from 96.2 in August, the second-highest level of the year and second-strongest since 2004. Reuters economists expcted the prelimary read on sentiment to reach 96.6. "Consumers anticipated continued growth in the economy that would produce more jobs and an even lower unemployment rate during the year ahead," said Richard Curtin, chief economist for the Survey of Consumers. Yields have continued to rise despite some tame inflation readings this week. The Consumer Price Index, which tracks prices on a wide range of goods Americans pay for, rose 0.2 percent in August from the prior month, the Labor Department said Thursday. Barring volatile food and energy components, prices increased 0.1 percent. Both increases fell short of economists' expectations. The Federal Reserve has raised rates twice this year and is forecast to hike again later this month. Chicago Fed President Charles Evans is set to make an appearance today at the Northeast Indiana Regional Economic Forum in Fort Wayne. Traders raised their expectations on Friday for a second rate hike in December to about 80 percent.